Teen Titans #18 continues the aftermath of both “Death of the Family” and the death of Damian Wayne, with some very strange goings on that center on Tim Drake. 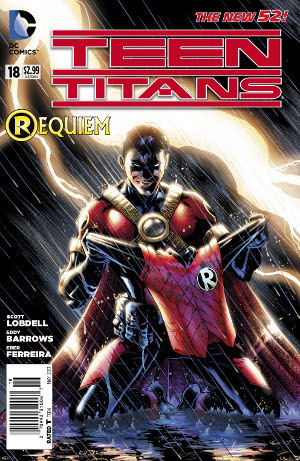 At this point it is hard to tell whether Tim is just being a jerk or if he has truly gone over the edge…but something is most definitely not right with Red Robin. This entry was posted in Reviews on March 29, 2013 by Ed Garrett. Flash March Madness – The Final Four is Set! The Championship Round will be held for two days, April 3rd and 4th. YOUR VOTES will determine Rogue Supremacy! As always, membership at The Fastest Forum Alive is free – but you can also login to vote with your Facebook, Twitter, Yahoo, or Windows Live account. Be sure to visit on April 1st as Flash March Madness continues! This entry was posted in Fandom, Fun, Timely and tagged Flash, March Madness, Rogues on March 29, 2013 by Ed Garrett. 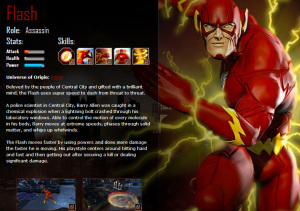 DC Comics is finally diving into the MOBA game genre with Infinite Crisis. Brought to us by Warner Bros. Interactive Entertainment and Turbine Studios, the game is set to debut in the Fall. Now for those unfamiliar with MOBA or Multiplayer Online Battle Arena games they are typically free to play and money is usually made off of micro-transactions within the game. Meaning smaller fees here and there to access additional content as opposed to one large lump fee in the beginning. Most usually don’t require you to pay to enjoy the game, but if you want any additional bells and whistles (often additional uniforms, powers or special content) you would have to pay. MOBA games are essentially action real-time strategy games but with the multiplayer aspect amped up. Instead of controlling large groups or squads you control one character and work together along with other human characters to complete objectives and challenge each other in combat. They often feature role-playing elements like leveling up and different levels of customization such as being able to choose which powers or moves one would like to focus on and utilize more often. 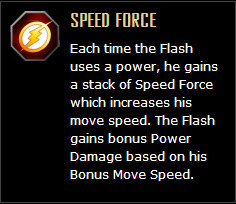 Instead of playing as a user-created character this game allows you to take control of a version of a DC character from one of the 52 alternate worlds that exist (or so they tell us) in the DC Universe. I’m envisioning a bunch of Batmen facing off against a bunch of different Jokers but we will see. 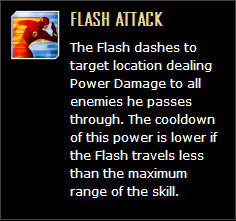 As you can see Flash’s character type is an assassin. 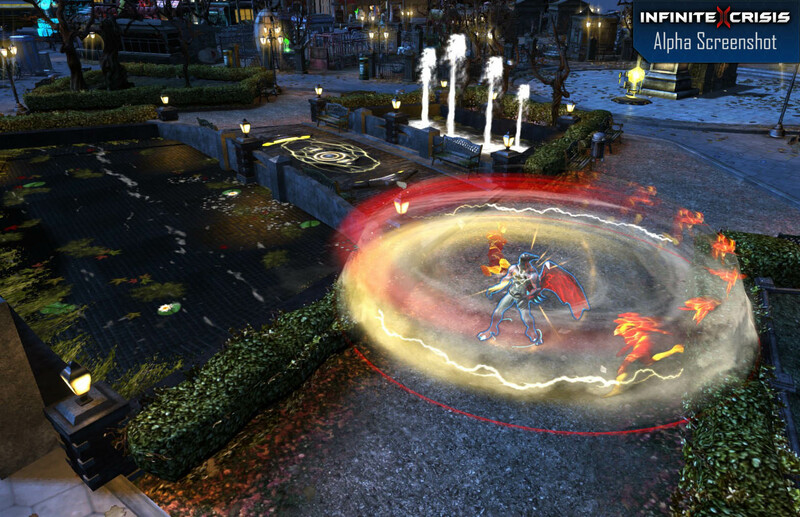 This type of character focuses on striking fast and hard and evasion. They typically can’t take too many blows so it is imperative that they avoid getting hit. I gotta say that I love the detail that they put into the bio. The profile picture is a little derpy but still looks pretty cool overall. Something about that grin though and the lack of pupils in his eyes makes him look very strange. Of course these are very early screenshots (the game is tentatively scheduled for release Fall 2013) but I’m really liking what we are seeing so far. 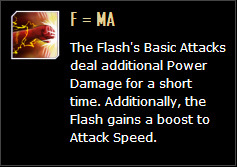 I will admit that my experience with MOBA video games is quite limited but I’m willing to give just about anything featuring The Flash a shot. We’ve seen no less than three different versions of Batman from the multiverse and so far they have given us a glimpse of the six core Infinite Crisis universes. 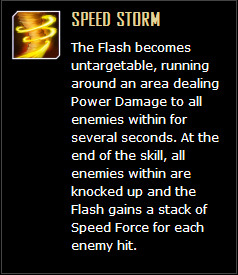 I’m wondering just what they are going to do with each one in relation to the Scarlet Speedster. I’m betting that the longer the game goes on the more universes we can expect them to add. Infinite possibilities. Infinite Crisis is being developed by Warner Bros. Interactive Entertainment and Turbine Studios and is tentatively scheduled for release later this year. 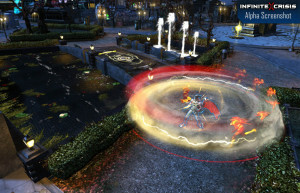 What do you all think of this new Infinite Crisis MOBA game? 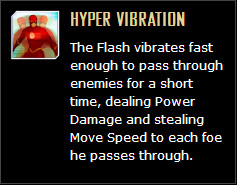 What alternate versions of Flash are you hoping to play as? What villains are you hoping to fight against? Please, let us know in the comments below. 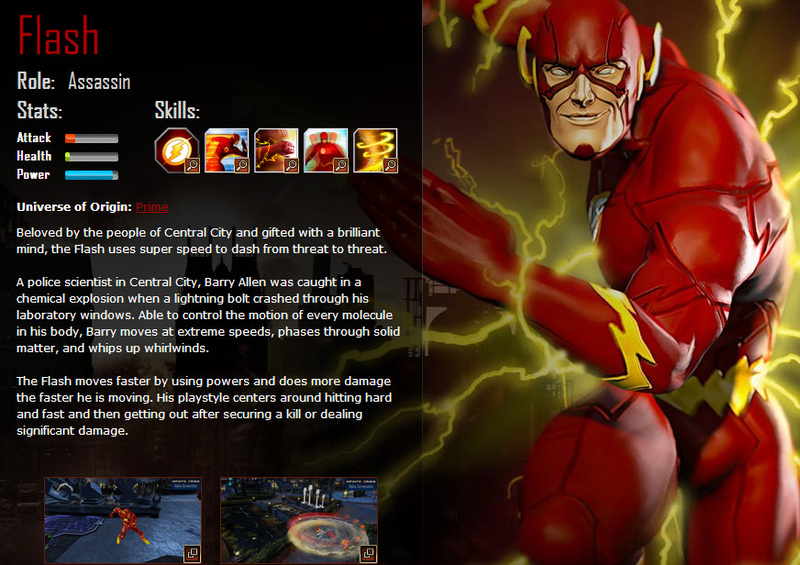 This entry was posted in Media and tagged Barry Allen, Earth Prime, Flash, Infinite Crisis, MOBA, multiplayer online battle arena, Turbine Studios, Warner Bros. Interactive on March 28, 2013 by Devin. Flash March Madness – Elite 8 Day 1 Results! As always, membership at The Fastest Forum Alive is free – but you can also vote by logging in with your Facebook, Twitter, Yahoo or Windows Live account. Your voice determines Rogue supremacy – be sure to vote at Flash March Madness! This entry was posted in Fandom, Fun, Timely and tagged Flash, March Madness, Rogues on March 28, 2013 by Ed Garrett. Now that Gorilla Grodd is lost in the Speed Force and the Gem Cities have time to heal, Barry begins issue #18 helping the Gem Cities rebuild from the devasation of recent battles. He is everywhere, and apparently one of the best wall-hangers and carpenters around (or at least a lot of Speed Force makes up for a lack of other training). It is just as well that he has so much to do, as Barry has yet to reclaim his old job – the bureaucracy of both the Police Force and the union haven’t been able to render a decision on his old job now that he is no longer “dead”. WARNING: SOME SPOILERS AHEAD! DON’T LOOK FURTHER UNTIL YOU HAVE READ THE ISSUE! 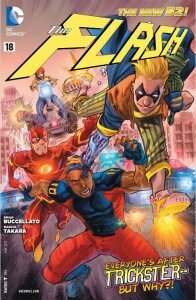 This entry was posted in Reviews and tagged Brian Buccellato, Flash, marcio takara, Speed Force, Trickster on March 27, 2013 by Ed Garrett. Flash #18 is out today. The Trickster is accused of murder! 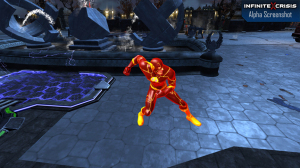 Can The Flash help solve his case? Plus, a surprising twist ending that will rock the world of…DIAL H? Preview at MTV Geek. As noted before, this is the first of two issues where Francis Manapul is taking a break. He’ll be back on #20. Also this week: the final chapter of Smallville Season 11 “Haunted” (guest-starring Impulse) arrives on ComiXology this Friday. There aren’t any new digital backissues of Flash or Impulse this week. This entry was posted in Out This Week and tagged Trickster on March 27, 2013 by Kelson.